O\'briens Creek Road to Burrandana Road. 14.7 Km. 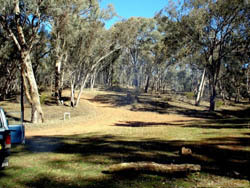 Livingston Forest is approximately 17 Km South East of Wagga Wagga from the Roundabout at Glenfield Rd and Redhill Rd. Continue out of town on the Mangoplah Road until you reach O\'briens Creek Road on the Left. Continue along O\'Briens Creek Road for 6.2 Km then turn Right into Wrigleys Road which is the Livingston Forest access Road. There are many tracks just after the rifle range through the forest and its realy easy to get lost (personal experience). The track I chose is a slightly longer track than the straight through track as the reason we go there is to have fun.